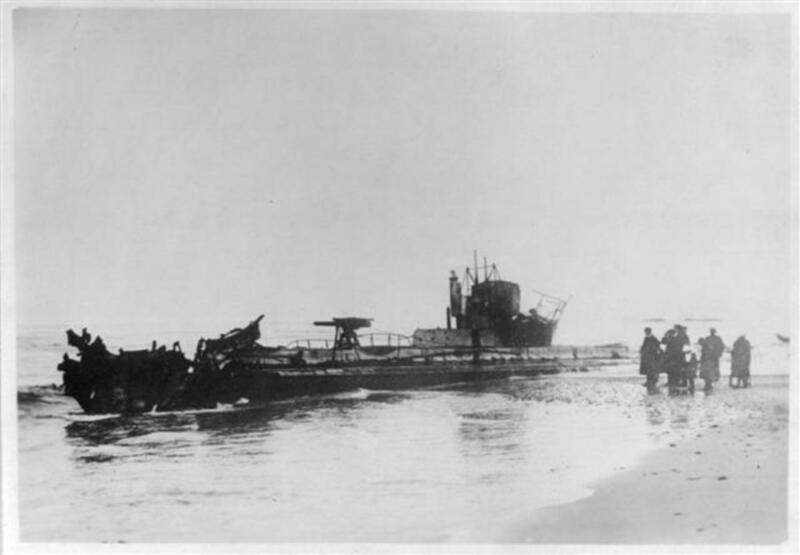 One of three significant events that took place in the first two months of 1915 was the launch by Germany of its U-boat campaign. On February 4th, 1915 the Commander of the German Fleet issued a declaration that stated that the waters off of Britain and Ireland were deemed to be war zones effective February 18th. All vessels in those waters were now in peril. Of course, U-boats had been active since the very beginning of WW1. At the dawn of WW1 in August 1914, 10 U-boats set out from their base in the North Sea to attack ships of the Royal Navy. 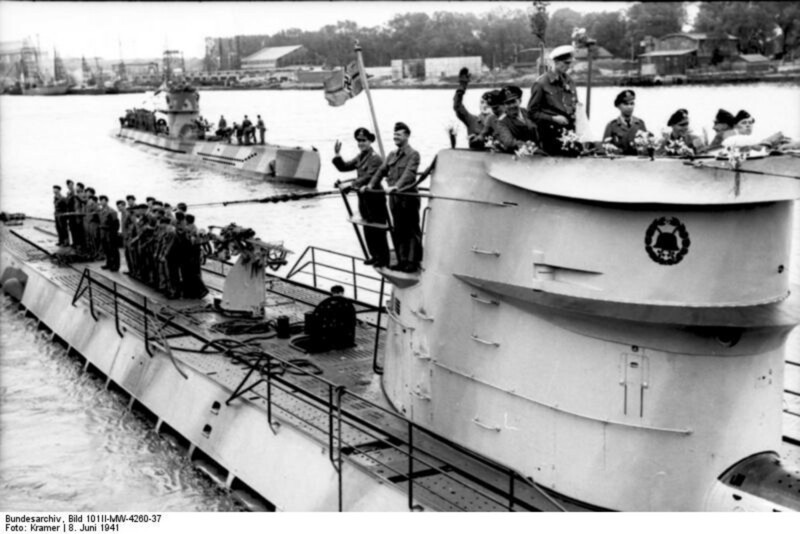 From that date forward, these submarines (the ‘U’ in U-boat stands for untersee or undersea) were very active, particularly in both the North Sea and the Mediterranean. 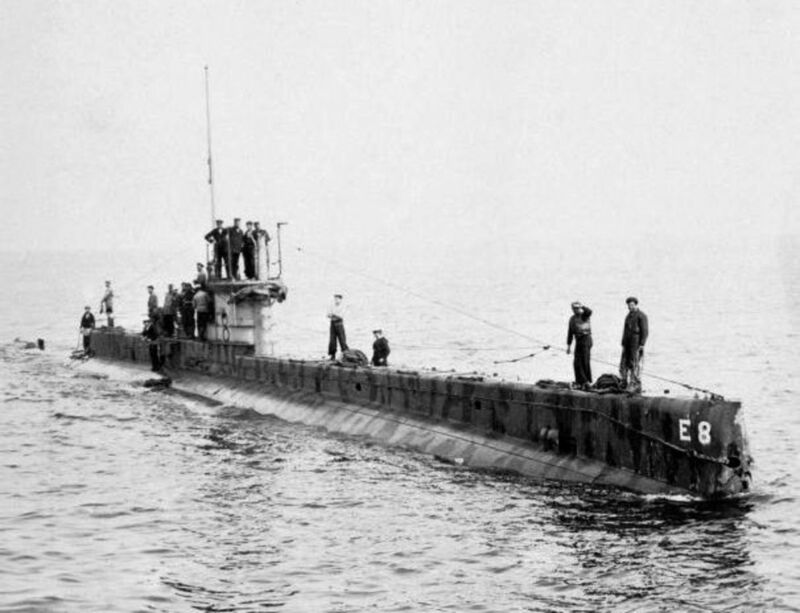 The first loss of a merchant ship to a U-boat occurred on October 20th, 1914 when U-boat U-17 intercepted the merchant ship Glitra bound from Scotland to Norway. Under what were known as the ‘prize rules’ of naval law, merchant ships could be boarded, their crew and passengers removed to a place of safety (not necessarily lifeboats, depending on the weather and sea conditions), and the ships could be scuttled. This is what happened to the Glitra. Her crew was placed in lifeboats, and the ship's valves were opened, allowing seawater to flood the ship and send her to the bottom. 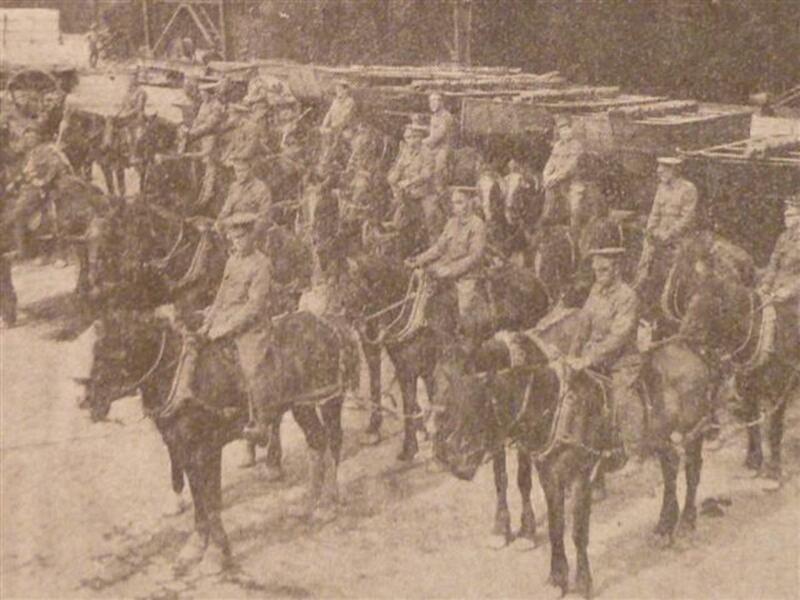 Britain, with her superior naval forces, had established a blockade of Germany when war was declared in August 1914. They took this a step further in November of that year when they declared that the North Sea was a war zone. This meant that any merchant ships entering the North Sea carrying goods – including food – destined for Germany were forced to dock in Britain and have any restricted cargo removed before resuming their journeys. The restriction on food supplies was seen as Draconian; even the US thought the restriction on foodstuffs was taking things too far. The Germans saw it as a blatant attempt to starve them out. Germany wanted to get even. So, on February 4th, 1915 German Commander von Pohl declared that from February 18th forward, the English Channel and the waters off England and Ireland were war zones. The plan called for a blockade of England enforced by German U-boats. The U-boats were virtually undetectable when submerged, meaning that they were a very effective weapon. Launched in 1906, the Lusitania was a luxury British passenger liner that was part of the Cunard Line. The Lusitania and her sister ship Mauretania were built for comfort and speed. They sported elevators and electric lighting, and were both spacious and comfortable. 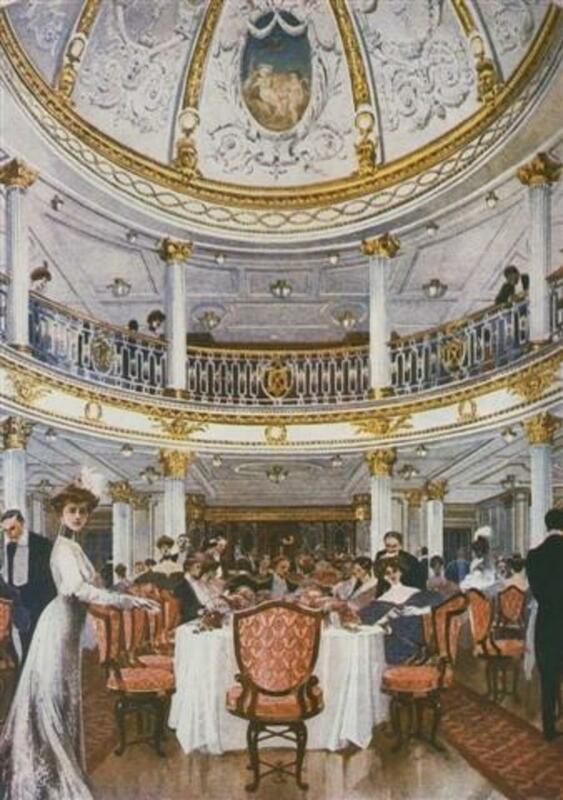 The first class dining room on the Lusitania spanned two decks, and featured a massive frescoed dome decorated in a classical style. Grand mahogany paneled public rooms with silk curtains and stained glass windows were common throughout. When she departed New York on May 1st, 1915 bound for Liverpool, no one could have imagined what was to come. The German embassy in the US had actually taken the unusual step of publishing a notice in the newspaper, suggesting that travelers sailing in the war zone were doing so at their own risk. Was Germany signalling their intent to attack the Lusitania? 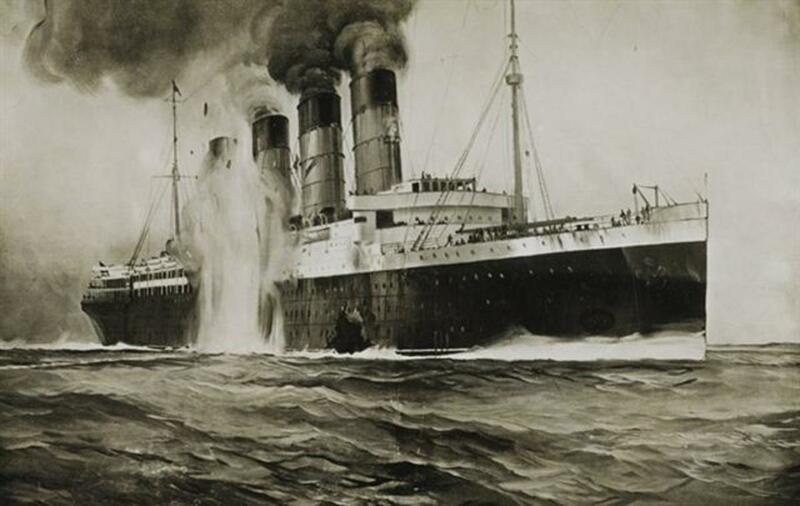 On May 7th at 2:10pm as she sailed about 11 miles off the southern coast of Ireland at the Old Head of Kinsale, the Lusitania was struck on her starboard side by a torpedo launched by the U-boat U-20. A second explosion from within the ship caused her to list severely to the starboard side. SOS signals were sent out continuously and were acknowledged, and the crew scrambled to get life boats into the water and evacuate the passengers. But she was going down quickly, and the severe list made launching the port-side boats almost impossible. Getting into the starboard boats was also extremely difficult due to the severe list, and many boats capsized. Of the 48 life boats on board, only six were successfully launched. Eighteen minutes after the torpedo hit, the bow of the ship slipped beneath the waves, causing the stern to rise into the air. Then she was gone. Of the 1,962 passengers and crew aboard the Lusitania, 1,192 lost their lives that spring afternoon, most of those due to drowning or hyperthermia. The Germans had broken international naval laws by firing on a passenger ship without warning. 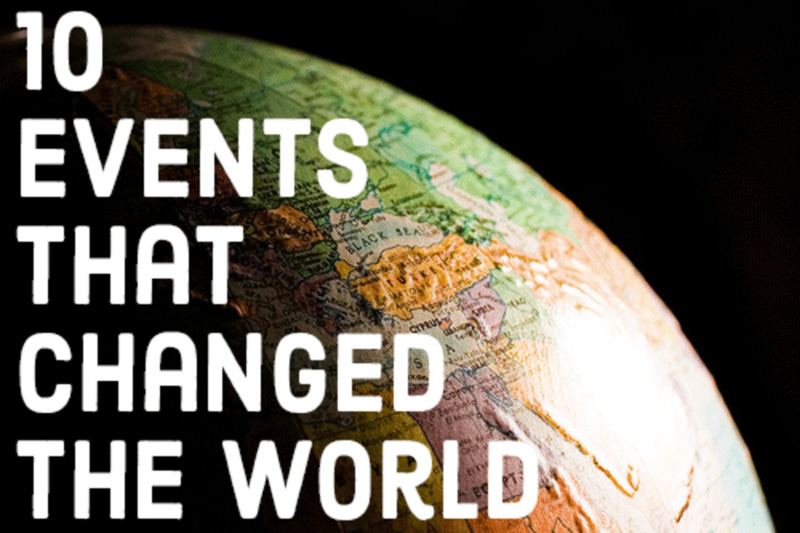 The outcry over the incident was heard around the world. How could they blatantly attack an unarmed passenger liner? Britain urged the US to declare war on Germany because 128 Americans lost their lives that day, but President Woodrow Wilson refused to act. Britain, for its part, put its propaganda machine into full swing, and even circulated a story that German school children had been given a day off to celebrate the sinking of the Lusitania. Though President Wilson had refused to declare war against Germany in 1915, the sinking of the Lusitania had a definite impact on public opinion in the US. Coupled with later diplomatic and shipping incidents, the sinking of the Lusitania helped to tip US public opinion against Germany and the US ultimately joined the war in 1917. On May 8th, 1915 Germany declared that they had a right to sink the Lusitania because she was carrying munitions and was formally listed as a merchant cruiser, making her a warship despite the passengers on board. They were right on at least one count; the Lusitania was listed as an 'auxiliary' warship, and she had been used to transport arms for years. Cunard denied that the Lusitania was carrying munitions at the time of the sinking, but the day after the disaster, the New York Times newspaper carried a story about the ship's manifest that listed small-arms shells and cartridges as part of her official cargo. Fast forward to 1982, and a surprising revelation from Britain’s Department of Defence. The Guardian newspaper carried an article that described Foreign Office files that had been released by the National Archives, confirming that there was a large amount of ammunition on the ship when she went down. Could this be what caused the explosion right after torpedo hit, or was it coal dust in the hold as was claimed? Germany claimed the ship was a ship of war. England claimed she was a passenger liner. Germany was clearly the aggressor and was looking to retaliate against Britain for the blockade that country had placed around Germany. Britain was playing a dangerous game, and was possibly using the Lusitania as 'bait' to help fuel anti-German sentiment in the US. MS Lusitania may have been carrying small ammunition but that was no excuse to take the lives of over 1,000 people. Unsure. The true facts may never be completely known. Hi Deb and thank you...such a tragedy, this was. War is ugly, and human life doesn't count for much in wartime, even innocent civilians. The Cunard Lines were known as being "cost effective," and I am being polite about this, as you can tell if you know their history. 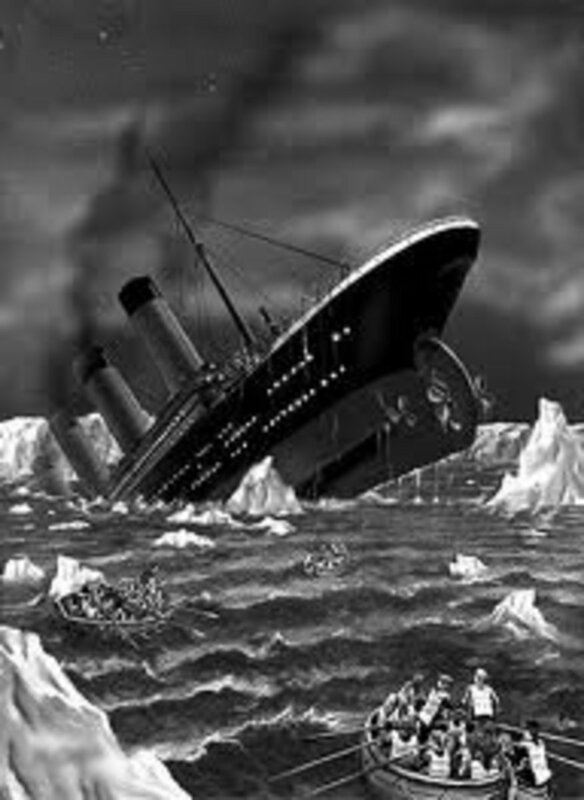 Since everyone that sailed the Titanic is now deceased, nobody can speak regarding that ship, which didn't even have all her bolts and welds in place. Nice piece on the Lusitania! Hello HSchneider and thank you for the wonderful feedback. Yes, Germany went too far and, and after some other not-so-brilliant moves like the Zimmerman telegram, US entry into the War was decided. Fascinating Hub about this tragedy Kaili. The German government was ultimately wrong to take down this ship regardless of the munitions aboard. This is true both from a humanitarian standpoint and a practical one. This event spurred America's entry into the war dooming Germany's victory chances. Germany feared our monetary and supply assistance. Our all in assistance had to be a worse outcome. Great Hub. Hello Zulma and thank you for following the series. I'm glad you are enjoying it; so much more to come! It is a topic near and dear to me, so I am trying to mix hubs about battles, which can make for pretty dry reading, with other hubs about people or major events during wartime. Just wanted to let you know how much I'm enjoying your WWI series. These are the details that tend to be glossed over during history lessons and I'm finding them quite interesting. Hi again CJ and thank you for the vote and for sharing. Agreed, the blast that took her down so fast had to be more than just a single torpedo. Some accounts from that time even mention a second torpedo. Her manifest clearly shows she was carrying munitions, but Schwieger should have forced the passengers off in an orderly fashion into life boats before scuttling her. They were close enough to the coast, seas were good, and SOS calls had been acknowledged. The ship was clearly carrying munitions; I don't think anyone can argue against that point anymore. The speed with which it sank makes that obvious. But Schwieger was wrong to sink her and was rightfully condemned in Berlin. He had no way of knowing for sure if the ship was carrying arms. Great article. 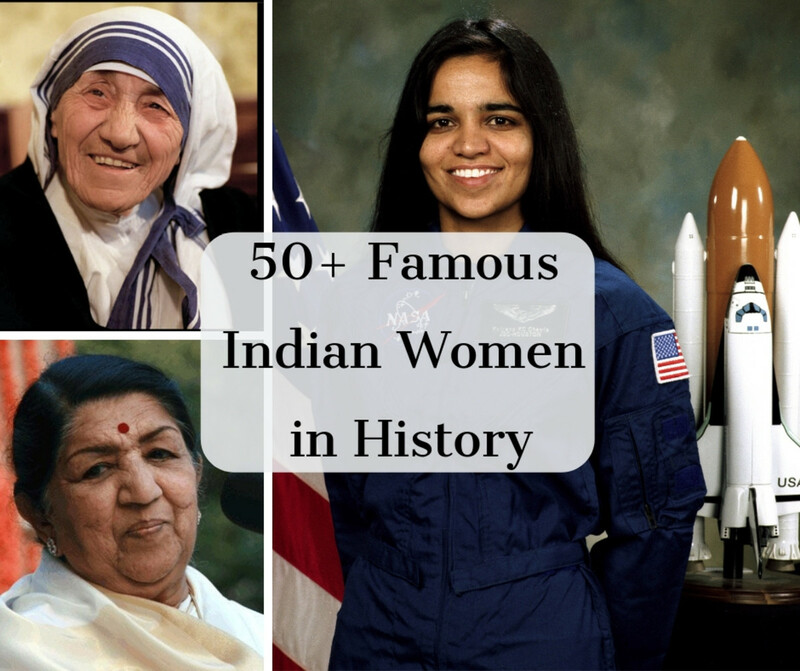 Voted up and shared.